Many thanks to all who have registered for our 4th Night Walk on Fri 12 Oct. Please read this guidance in advance and contact me if you have any questions. There’s still time (just) for others to register too, so please encourage as many as possible to register at Eventbrite and come on the Night Walk. It will also be possible to register on the night at the Fentham Hall, but it helps us a lot if people register in advance, and it will take longer to register in the night than to use Eventbrite in advance. Headtorches – we have lots to give out, but if you have your own and can bring it with you, it will reduce costs to Cameron’s Trust. Remember to check your batteries. Please use your headtorch at all times in part to help you see, but especially so you are visible to other road users. Feel free to decorate yourselves with glow sticks, fairy lights, etc – make yourself glow! 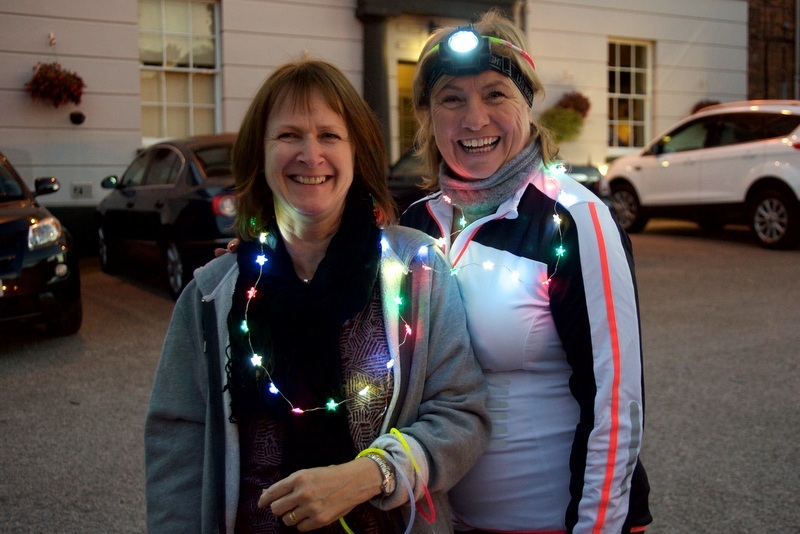 We will have some glow sticks available at the start but why don’t you see if you can do better than Kathy and Julie did! Arrival & directions: the walk will be taking place from Fentham Hall, Hampton in Arden. We expect to have the extended part of the Fentham Hall Car Park (in the field next to the main car park) open, and we will have marshals in the Car Park this year, but parking will still be limited. If you are able to, please walk to the start or car share or get dropped off so we avoid having cars parked all over Hampton. Start & end location: the Night Walk will start from, and end in, the Fentham Hall. The entrance is “behind” the main building. From the road entrance to Fentham Hall Car Park off Marsh Lane, go towards The Beeches, then turn right, keeping Fentham Hall on your left. Turn left at the end of the Hall, and you will see the entrance ahead on your left. Registration: everyone must register on arrival. You may arrive to check in to the walk from 6.15pm and can start the walk any time between 6.30pm and 8pm. We set an earlier start time of 6:30pm with younger walkers in mind. If you don’t have younger walkers in your group, please come closer to 8pm. It really helps us if everyone does not start at once, so please come later on if you can. You MUST also check in at three points around the route (these are indicated on the map you will be given at the start and which is attached) and check out at the end – failure to do so will cause us to have minor heart attacks and we WILL come to look for you – please help us by checking in and out at the correct places. Some walkers may wish to stop and be collected at Barston Village Hall, and some may wish to stop and be collected after reaching the “gazebo” checkpoint outside the West Midlands Golf Club clubhouse. Please, please, please make sure that the marshals at these checkpoints know you are stopping. For example, please do not collect your child from the West Midlands Golf Club car park without letting the marshals at the “gazebo” checkpoint know. Please also note that the West Midlands Golf Club is hosting a function in the clubhouse and have asked that we do not use the toilets, the bar, or any of the other clubhouse facilities. What to wear: weeds and brambles are still present and it will be damp in places, with a few wet patches. We expect that it will be cool, but not cold, and that there will be some rain. Make sure to wear long trousers to protect your legs and we suggest walking boots/shoes or wellingtons rather than trainers (you will most likely get wet feet if you wear trainers!). By and large, the path is not particularly muddy but the footpath does cross some fields that were ploughed recently. Please make sure your footwear and other clothing will cope with this. Shoes with any kind of heel or smooth soles are not appropriate and should not be worn. Above all, be comfortable and supported in your footwear. Pictures: please bring your camera to take pictures of the event. 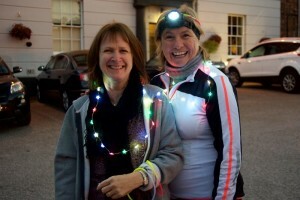 We would love to see them afterwards, and you can send them to us at nightwalk@camgrant.org.uk. We will also have a photographer taking pictures so, if you don’t want to give permission for us to use any picture you may appear in for publicity, please let us know. We will also ask you this when you register at Fentham Hall. Walkers aged 15 & under should all be walking with a responsible adult – we will check this at registration, so please be aware of this requirement. If you are one of the Responsible Adults, please walk with your “under 16s” at all times. Last year some “under 16s” completed the walk as much as 30 mins ahead of their Responsible Adults, which rather defeats the point. Responsible Adult means the “under 16” or “under 16s” are in your care and we need you to walk with them. You are taking part at your own risk: we have checked the route multiple times, and will walk it again on the afternoon of 12 Oct. The route is safe to use, but you must make your own assessment based on your own abilities. It is not a hard route but you will be out in the countryside where paths are not paved and mud and water exist. Please be aware that the usual risks of walking in the countryside will be present during the Night Walk, and that you will have to work harder to see them in the dark. Take extra care when walking over muddy ground or stiles that you need to climb over and look out for overhanging branches or overgrown weeds. Also pay special attention to the wooden bridges – some are just planks over ditches – which can be very slippery. The bar will be open in the Fentham Hall after the walk and The Disclaimers will be playing from 9:30pm. We encourage everyone to stay and share stories of the evening’s trek in the dark. That’s it, we look forward to seeing you tomorrow, and please let us know if you have any questions beforehand. PS you do not need to bring your Eventbrite tickets with you. We will be checking you in and out by name.